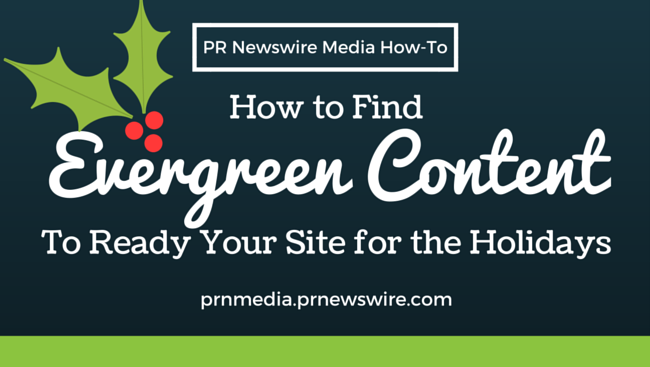 This latest installment of PRN Media How-To focuses on making the most of PR Newswire for Journalists’ tools for creating fresh holiday content. Catch up on previous how-tos and try our free media tools for yourself by signing up at prnmedia.prnewswire.com. The holidays can be an exciting and restful time. But until you walk away from the newsroom for your official break, you’re in charge of posting daily, quality holiday content to your news site. This deadline doesn’t always lend itself to creative writing. Most of the time, you’re forced to add new life to the same old holiday stories. Try a different approach this year. Start with using the advance search tool on PR Newswire for Journalists and drive compelling content into those empty website spaces. Keep these five things in mind, when readying your site for the holidays. Thanks to the rise in content marketing, news releases have become great vehicles for storytelling. Marketers and publicists know you’re pressed for time and low on staff through the new year, so they’re making releases easier than ever to use. In fact, we’ve noticed a boost in blog and lifestyle releases. Recently, we carried the release about the Most Extensive Face Transplant to Date. It featured a before – and after – photo of the volunteer firefighter who underwent the surgery. The image made top news all over the country, and it was available through PR Newswire. Need more multimedia elements for your site? Many releases also cross the newswire as complete press kits. An example: Ad Council, U.S. Department of Transportation and Project Yellow Light Join Forces with YouTube Star Meg DeAngelis to Prevent Texting and Driving was distributed in English and Spanish with videos and photos, social media components, and stats to pick and choose from. If you cover the hospitality industry, you likely have seen the recent release that Marriott International plans to acquire Starwood Hotels & Resorts. Sometimes that kind of huge news hook is all you need to start thinking about how to advance the story. It’s the holidays – there are several angles you can take here. For example, holidays tend to get gussied up right about now. How will Marriott’s new partnership with Starwood change how Starwood properties are decorating? Let’s think beyond the holidays: Does Starwood expect post-holiday meetings and convention bookings to increase now that it’s going to be tied to an icon like Marriott? Who doesn’t love that evergreen copy? So unless a major news event occurs, you’re probably still recycling the same ideas, tweaking them a bit, and adding a 2015 label. Holiday travel tips. And even more holiday travel tips. Finally, if you’ve not already tried our ProfNet service, give it a try. There are thousands of sources available for interview at any time. Authors Christine Cube and Jessica Alas contributed to this post. Cube is an audience relations manager with PR Newswire and freelance writer. Follow her at @cpcube. Alas is multicultural audience director with PR Newswire. Follow her at @alasjessica.